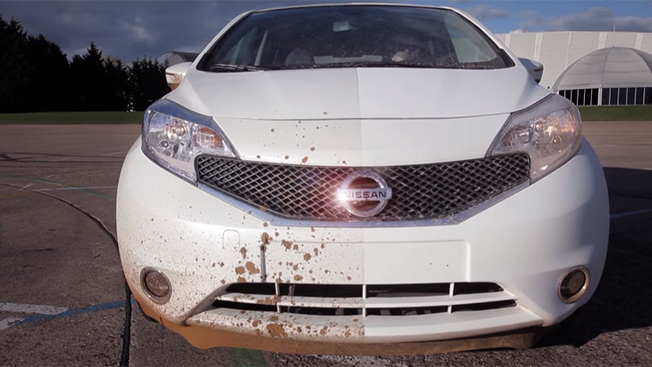 Nissan has created the world’s first self-cleaning car prototype and introduced it with an eye-popping NeverWet-like viral spot. The car's coating isn't actually the well known hydrophobic spray owned by Rust-Oleum, though the effect is similar. Created by UltraTech International, Nissan's coating creates a texture of geometric shapes whose peaks repel water and some oils. The spot is one delightful minute of watching the Nissan Note crash through puddles and repel filth on the side treated with the hydrophobic and oleophobic coating. Nissan states that splashing around in mud will still dirty the underbelly, tires and windshield of the vehicle, but it's still an exciting development for the lazy among us who hate visiting the car wash. Currently, Nissan says it has no plans to offer the paint as a standard option, but after the success of this video (2.9 million views and counting), the automaker might rethink that decision.